Lake Champlain can present a formidable challenge to paddlers on the Northern Forest Canoe Trail. From Plattsburgh to the Missisquoi delta there are at least two significant open water crossings. This article offers some information on open-water conditions, some tips for open-water paddling, and some local knowledge of Lake Champlain, aimed at helping make wise choices regarding route or whether to venture out at all. It is not a substitute for personal experience and good judgement. I have encountered 30-inch swell in Cumberland Bay; 30+ mph NNW wind with nearly 3 feet of chop approaching the Missisquoi; utterly tranquil conditions; violent, squally downpours and more. You take what you get! The Northern Forest Canoe Trail route on Lake Champlain. The prevailing south-westerly wind in Lake Champlain often accompanies fair weather. Wind from the east or north-east more likely indicates variable weather, possibly rain (or snow). These are generalizations, not guarantees. I have watched many thunderstorms roll across the Champlain Valley from the west. Weather information for Lake Champlain can be found through the National Weather Service, but be warned: the forecast wind-speed is often up to 10 mph less than reality. Lake waves, from riffles to large swell and breaking waves, are caused primarily by wind, their size depending on wind-speed and fetch. Fetch is the uninterrupted expanse of water across which wind can blow, amalgamating smaller into larger waves. 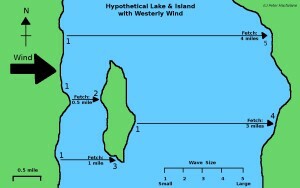 A longer fetch and stronger wind cause larger waves. A windward shore (upwind of you) offers more shelter with smaller waves. A leeward shore (downwind of you) faces a longer fetch and offers little or no shelter. Whilst it may be tempting to head downwind to escape worsening conditions, this often leads to even rougher conditions. Swell—usually rounded waves, not steep—presents little difficulty in open water. The canoe or kayak rides over it with minimal rolling or pitching. Chop, which forms especially when strong wind blows across shallow water, comprises steeper, often more irregular waves, more likely to break over a kayak or into a canoe. Their steepness causes more rolling and pitching. A canoeist can enhance stability in rough conditions by sliding off the seat to kneel, lowering the center of gravity. Knee-pads, whether worn or fitted, can make extended kneeling more comfortable, but should not be slippery against the hull. Being broadside to waves, especially chop, can roll the boat uncomfortably. Paddling directly into waves may cause excessive pitching and a wet ride. Paddling directly with waves can lead to surfing, exhilarating if controlled, but likely to capsize the uninitiated. Paddling at an oblique angle into waves is a compromise which minimizes rolling and pitching. This may require taking a zigzag course towards your destination. An oblique angle may help going with waves, but they will still surf you, turning you broadside. As that happens, lean the boat towards, and brace on, the wave. Dropping the paddle and gripping the gunwales achieves only one thing: when the boat capsizes, you will go with it! As waves reach shallower water, they stand taller and steeper, and then break. The release of energy can exert large forces on a boat. Even swell, innocuous in open water, will eventually reach the shore and break. This can make landing and launching difficult. If conditions are deteriorating mid-lake, safe escape to land is becoming ever less easy, especially on the leeward shore. Waves reaching a vertical shore, e.g. rocky cliff, are often reflected. Where they meet the incoming waves, they may interfere to produce large, irregular waves which toss a small boat about. At headlands, wind is funneled thus increasing its speed, and the continuation of the headland underwater creates shallow water. The combined effect is to generate some of the roughest conditions. This is localized, so, if you can round the headland, you’ll usually find calmer conditions beyond (other factors notwithstanding). In short, whilst being close to shore may be comforting, it is often true that the most demanding paddling conditions are, somewhat perversely, found close to land. Those with the confidence to seek more open water can often find easier paddling. Lake Champlain warms up only slowly in spring. Having swum (deliberately) in early May, I can attest that an extended swim then would be dangerously cold. It is usually late June before I take the plunge. A capsize mid-lake can easily prove fatal: can you self-rescue or swim to shore in less time than it takes to lose consciousness? Before deciding whether to venture out, add water temperature into the equation; it may tip the balance of the decision. In a thunderstorm, avoid being the tallest thing around. Make no open crossings when lightning is a possibility. Much of the shore of Lake Champlain is private. Whilst emergency landing is fine, routine landing is best avoided. Study your map to find the locations of public boat launches; these offer safe take-out. Most of the shore is rock or loose shale. Stout footwear is recommended for embarking and disembarking. For those who cherish their canoe’s livery and jump into the water before landing to keep the canoe afloat, stout footwear will protect against not just rocks but also invasive, razor-sharp zebra mussels. Camping options exist at Campmeeting Point in Knight Point State Park, at Knight Island (check availability with the Ranger: (802) 343-7236), at North Hero State Park, although closed (do not disturb the nesting beaches of the endangered spiny softshell turtles), and at either end of Hog Island. For more details, see Katina Daanen’s “The Northern Forest Canoe Trail Through-Paddler’s Companion”. Your choice of overnight accommodation will influence your route. From the mouth of the Saranac River, you immediately face Cumberland Bay. Cumberland Head lies 3 miles to the east-south-east. To follow the shoreline adds 2.25 miles. With a generally westerly wind, the crossing starts calm, but Cumberland Head will experience a fetch of about 3 miles, with correspondingly larger waves. It can also offer choppy conditions with strong wind and shallow water. A southerly wind has the longest fetch, blowing waves many miles up the lake. The next obstacle is the ferry lane, usually with three ferries operating between Cumberland Head and Grand Isle. Cross only behind a ferry, never immediately in front. The easiest place to identify the ferry lane is beside the dock: you can see how many ferries are present, whether one is about to depart, and how far to paddle to clear them. Now it’s decision time: continue up the western shore (less common) or cross to South Hero (more usual). The Gut between South Hero and North Hero Islands. If the wind is from a westerly arc and you have no desire to visit North Hero village, one option is to continue north along the western shore. This does, however, require a crossing of over 1 mile to reach Isle La Motte and another of nearly 1.4 miles to reach North Hero island. Here you can enter Alburgh Passage (Inside Passage) between the Alburgh peninsula and North Hero, usually more sheltered than the open lake. You can re-join the Easterly route at Stephenson Point (northern tip of North Hero) or the Route 78 bridge, or even the mouth of the Missisquoi. The Carrying Place on Lake Champlain. North of the ferry lane, cross to South Hero (1.4 miles), head north and turn into The Gut, a large enclosed bay between South and North Hero, usually calmer than the open lake but, being shallow, often choppy. Follow the eastern shore of North Hero to City Bay to visit Hero’s Welcome and the Northern Forest Canoe Trail kiosk. From there, continue north up the Outside Passage, either to Stephenson Point or to the Carrying Place for transfer to Alburgh Passage: if there’s enough water, float through the culvert; otherwise carry across Route 2. Alburgh Passage leads either to Stephenson Point (if you stay by North Hero) or to the Route 78 bridge (if you cross to the west). From Stephenson Point there’s an unavoidable crossing of 1 mile north-east to Clark Point near the southern end of Hog Island. Then follow the shore north to the Route 78 bridge. These two routes have now nearly converged at the Route 78 bridge. If you wish to cross the lake here, the old railway bridge may provide some shelter, not slowing the wind much but breaking up waves. Continuing north on the eastern shore leads to Donaldson Point, from where there is a final crossing, about 1.4 miles north-east, to the Missisquoi delta. Aim for the end of a thin line of trees that protrudes into the lake. Faced with a very strong NNW wind in 2013, I declined this highly exposed crossing to the delta and continued up the western shore to the Canadian border before crossing 1.6 miles ESE in a very choppy, shallow part of the lake. There are options, if not all pretty! If you decide the water is not for you, congratulations on having the courage to admit this. Your options are to wait for calm conditions or to take a non-paddling route. 1) The ferry from Cumberland Head to Grand Isle. I have never tried this with a canoe, but you may be able to argue for the bicycle rate. This lands you on an island. It’s then a long carry (29 miles!) via North Hero, the Alburgh peninsula and the Route 78 bridge to mainland Vermont and Louie’s Landing on the Missisquoi. 2) If rough conditions force you ashore on North or South Hero, you’ll usually find a shore road nearby (maybe across private land) where you can start the long carry north. 3) East of Hog Island in Maquam Bay it’s possible to find access to a road that leads into Swanton (1.8 miles to the dam). How far you walk before accepting a ride or how much of the Trail you choose to omit may depend on your schedule or on how near to the ‘stubbornly independent purist’ end of the spectrum you lie. Finally, an offer of a service: for through-paddlers who are leery of open water but determined to paddle the entire trail, I may be able to paddle with you for company. This depends on your timing and my schedule. Please contact me to discuss this (details below). Disclaimer: Reading this article neither enhances your personal experience nor causes you automatically to make wise decisions. There is no substitute for paddlers’ awareness of their own abilities and limitations, and a thorough knowledge of the handling of their craft in the conditions to be encountered. Be safe and enjoy it! Peter Macfarlane lives in the Champlain Valley of Vermont, making his living as a musician and builder of cedar-strip canoes. In one of these he completed a solo through-paddle of the NFCT in 2013, and is now trail maintainer for the Lake Champlain section. He has decades of experience of paddling both kayaks and canoes in diverse waters, and is happy to share this experience. To contact him, please visit: www.OtterCreekSmallcraft.com. Best Time to Start a Thru-Paddle?